Detective Ulf Varg from the Department of Sensitive Crimes is often called upon to investigate unusual matters. But rarely is he asked to conduct an inquiry on behalf of his own family. Is such a thing ethical? Adding to Ulf’s moral discomfort is the fact that he does not exactly see eye to eye with his younger brother Bjorn—a leading player in one of Sweden’s right-wing p Detective Ulf Varg from the Department of Sensitive Crimes is often called upon to investigate unusual matters. But rarely is he asked to conduct an inquiry on behalf of his own family. Is such a thing ethical? Adding to Ulf’s moral discomfort is the fact that he does not exactly see eye to eye with his younger brother Bjorn—a leading player in one of Sweden’s right-wing parties, the Moderate Extremists. Still, family is family, so Ulf finds himself working to uncover the mole leaking secrets to a rival party, the Extreme Moderates. All of this in addition to his responsibilities to the Department, which include investigating a case of cat-related sabotage. As always, it’s up to Ulf to close the case . . . even if he encounters unexpected resistance from the victims themselves. From literary master McCall Smith, this is a bewitching short foray, witty and warm, into Scandinavian mystery. To ask other readers questions about The Strange Case of the Moderate Extremists, please sign up. This is a quirky & charming short story from the author of the “No. 1 Ladies’ Detective Agency” series & many other books. Ulf Varg is a detective with the Malmo PD but you’ve probably never heard of his unit. He heads up the Dept. of Sensitive Crimes & their case load is a little…uh…unconventional. Take his current investigation. At a recent Cat Show, someone introduced a purebred Burmese named Duchess to a scruffy tomcat from the wrong side of the tracks. Needless to say, the resul This is a quirky & charming short story from the author of the “No. 1 Ladies’ Detective Agency” series & many other books. Ulf Varg is a detective with the Malmo PD but you’ve probably never heard of his unit. He heads up the Dept. of Sensitive Crimes & their case load is a little…uh…unconventional. Take his current investigation. At a recent Cat Show, someone introduced a purebred Burmese named Duchess to a scruffy tomcat from the wrong side of the tracks. Needless to say, the resulting litter is the talk of feline aficionados everywhere & Duchess’ owner wants the evil matchmaker brought to justice. Meanwhile, Ulf has a more personal case to handle. His brother Bjorn is a politician & leader of the Moderate Extremists. Someone in his party has been leaking confidential info to their rivals, the Extreme Moderates. Can Ulf quietly flush out the mole? On top of all this, Ulf has problems at home. His dog Martin may be sliding into depression again & it’s possible he may have to undergo another round of psychotherapy. Ah, it never rains but it pours. I read the first book in the Department of Sensitive Crimes when it was published in December and thoroughly enjoyed it. I have read all of Alexander McCall Smith’s Ladies’ Number 1 Detective Agency series, and the entire 44 Scotland Street books, as well as many of his other books. This short 88-page book serves as an introduction to the author’s new series. He writes cozy stories which charm the reader with much wit, wisdom, a philosophy of values, and good humour. I cannot give this novella I read the first book in the Department of Sensitive Crimes when it was published in December and thoroughly enjoyed it. I have read all of Alexander McCall Smith’s Ladies’ Number 1 Detective Agency series, and the entire 44 Scotland Street books, as well as many of his other books. I cannot give this novella any higher than a 3-star rating. Its short length didn't give enough insight into the workings of the Department of Sensitive Crimes. Book 1 in the Detective Varg series is a better introduction to this unique department. With the exception of Detective Varg, we don't learn much about his colleagues here. Unlike the dark, disturbing, and popular Scandinavian noir, McCall Smith’s take on Swedish crime is gentler and more relaxing. Unusual, and even insignificant crimes are passed on to this department. Varg has two cases in this book, but with no definite solution, except for Varg and coworker, Anna, discussing what they believe happened. Ulf is a senior member of the Department of Sensitive Crimes, which investigates unusual cases. His current case concerns sabotage ...of a purebred cat. The owner wants justice for her feline who was caged with a tomcat resulting in a litter of undesirable kittens and ruining the good name of the cat breeder herself. Ulf's greatest asset is his thoughtful observation of people and their behavior. This as This short story introduces us to Alexander McCall Smith's latest quirky character, Ulf Varg. Ulf's greatest asset is his thoughtful observation of people and their behavior. This asset leads to a lot of uncomfortable situations in his personal life. He's secretly in love with his partner, Anna, who is (seemingly) happily married. Outside the office, Ulf is uncomfortable when asked to look into his brother Bjorn's right-wing political party, the Moderate Extremists, who appear to have a mole in their midst. Ulf does not see eye-to-eye with his brother about politics and may not have the answer Bjorn would like to hear. Thanks to Knopf Doubleday Publishing Group and NetGalley for providing me with an ARC in exchange for my honest review. The Strange Case of the Moderate Extremists is scheduled for release on February 26, 2019. I really enjoyed this, in fact better than the debut novel. It has This is a short novella in the new Swedish detective series McCall Smith is writing about the Department of Sensitive Crimes. This is a really off beat group and they investigate crimes that really don't belong anywhere else. This one involves two cases. One is a tom cat who ends up mating with a purebred. Was it sabotage? The other involves Ulf's (department head) brother and the chicanery in his extremely odd political party. Detective Ulf Varg from the Department of Sensitive Crimes is often tasked with the job of solving cases of unusual nature. In this novella, he finds himself handling 2 puzzling cases which he tries to solve along with his compatriot Anna. The cases aren't as complex as you would imagine but somehow the narration manages you to keep you absorbed in it. The detective Ulf's character was sketched nicely, especially his background which gives you a glimpse of the kind of person he is. I have read a Detective Ulf Varg from the Department of Sensitive Crimes is often tasked with the job of solving cases of unusual nature. In this novella, he finds himself handling 2 puzzling cases which he tries to solve along with his compatriot Anna. The cases aren't as complex as you would imagine but somehow the narration manages you to keep you absorbed in it. The detective Ulf's character was sketched nicely, especially his background which gives you a glimpse of the kind of person he is. I have read a couple of British mysteries, American Mysteries etc but never a Scandinavian one. So it was refreshing to read a quick mystery novel that offered a slice of the Swedish life. The twists were quite unexpected and I think that is what is expected from any mystery book. So it deserves 4 stars for sure. So, Why not 5 stars?? The cases seem to untangle on their own before Detective Ulf even tried to deduce the suspect in both the cases. Although it let down me a bit, the penultimate turn of events was quite fresh and new. So I'd recommend you to read it provided that you don't expect Ulf to showcase his wit and brilliance every time you flip the page. This novella introduces us to the characters of the Malmo Police Department of Sensitive Crimes, which is composed of Ulf Varg, Anna Bengsdottor and Carl (who apparently never leaves the office, but whose unexplained absence wasn’t acknowledge in the novella). The department is This is my first read of anything written by Alexander McCall Smith. I was immediately attracted to it because of the title—I mean, how can you not be intrigued by a title about Moderate Extremists, whatever that might be? This novella introduces us to the characters of the Malmo Police Department of Sensitive Crimes, which is composed of Ulf Varg, Anna Bengsdottor and Carl (who apparently never leaves the office, but whose unexplained absence wasn’t acknowledge in the novella). The department is tasked with solving bizarre and often insignificant crimes, such as the one that Ulf and Anna work to solve in this story: the case of the ginger tomcat from the wrong side of the tracks, who has an unwelcome liaison with a purebred Burmese. It’s a scandal, but was it sabotage? Outside of work, Ulf also has to deal with his politician brother who realizes that there’s a snitch within his Moderate Extremists party that’s leaking important ideas to the opposing Extreme Moderates. The story touches upon the fickleness of humans with a good dose of Scandinavian charm and comedy. Although I felt that the writing style in this meandered slightly and the storyline was honestly a little anticlimactic, the wholesome, quirky characters and their interactions made it an enjoyable read. If all of Smith’s novels are like this, I’d be keen on reading them all, though I’ll definitely be picking up the new series on The Department of Sensitive Crimes when it also comes out later this year! The Strange Case of the Moderate Extremists is a Vintage Short by author Alexander McCall Smith. Swedish Detective Ulf Varg is a member of The Department of Sensitive Crimes. His younger brother, Bjorn, leader of the Moderate Extremist Party suspects someone is leaking their ideas to the media as well as to their political rivals, the Extreme Moderates and wants Ulf to suss out the traitor. 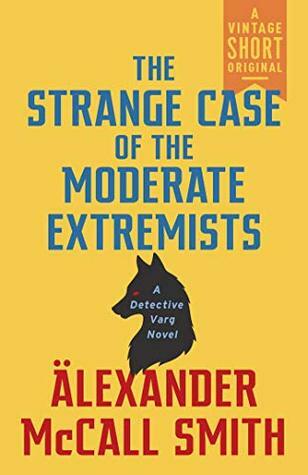 Ulf has mixed feelings since he doesn't support the party and he's not sure it would be ethical for him to The Strange Case of the Moderate Extremists is a Vintage Short by author Alexander McCall Smith. Swedish Detective Ulf Varg is a member of The Department of Sensitive Crimes. His younger brother, Bjorn, leader of the Moderate Extremist Party suspects someone is leaking their ideas to the media as well as to their political rivals, the Extreme Moderates and wants Ulf to suss out the traitor. Ulf has mixed feelings since he doesn't support the party and he's not sure it would be ethical for him to investigate but, on the other hand, it is his brother asking so what to do. Alexander McCall-Smith is starting a new series and has given us a short story to whet our appetites. I didn't like the characters and will not be reading this series when it comes out. Neither strange nor a particularly good case. I am a little ashamed to confess that this is my first foray into the mind of Alexander McCall Smith and I found it to be a delightfully straightforward and amusing place to be. This tells the story of Ulf Varg, a detective in the department of sensitive crimes in Sweden as he investigates the rogue impregnation of a prize winning cat by a tom, whilst trying to discover who is releasing party secrets for his politician brother. The story is really simple in narrative structure and the characters I am a little ashamed to confess that this is my first foray into the mind of Alexander McCall Smith and I found it to be a delightfully straightforward and amusing place to be. This tells the story of Ulf Varg, a detective in the department of sensitive crimes in Sweden as he investigates the rogue impregnation of a prize winning cat by a tom, whilst trying to discover who is releasing party secrets for his politician brother. The story is really simple in narrative structure and the characters are sweet, if a little stereotypical. I found the tone amusing and the interactions between the characters felt natural and authentic, as did the dialogue and motivations. This is a short little novella which is a great introduction to the Department of Sensitive Crimes series and I will definitely pick up more books in this series as they are released. All in all, I enjoyed this quite a lot. Em maio Sandy inaugura uma nova série, The Department of Sensitive Crimes, liderado pelo detetive Ulf Varg e nos brinda com essa novela introdutória a fim de nos apresentar seu personagens. Trata-se de um departamento da polícia sueca cuja tarefa é resolver os mais inusitados, complicados e, frequentemente, insignificantes crimes. Aqui conheceremos Ulf Varg desde sua infância com seu irmão Bjorn. Ambos passaram suas melhores férias na magnífica propriedade de seu rico tio, que teriam sido perfeita Em maio Sandy inaugura uma nova série, The Department of Sensitive Crimes, liderado pelo detetive Ulf Varg e nos brinda com essa novela introdutória a fim de nos apresentar seu personagens. Aqui conheceremos Ulf Varg desde sua infância com seu irmão Bjorn. Ambos passaram suas melhores férias na magnífica propriedade de seu rico tio, que teriam sido perfeitas caso eles não fossem obrigados a assistir todas as noites aos filmes de Ingmar Bergman. Varg vive sozinho com seu amigo Martin, o único cão surdo que aprendeu a ler lábios. Nessa pequena obra Ulf se vê se envolvido numa caso de traição no partido político de seu irmão, os Moderados Extremistas (?). Também terá que solucionar um "crime" envolvendo uma gata com pedigree que teve sua ninhada manchada ao se envolver com um gato vira-lata. GoodReads lists this as coming before book 1 in this new series, but I read it after /The department of sensitive crimes/, which I think would probably be less frustrating for most readers. The characters and general story set-up get more introduction in the novel. Reading this first, the reader might have more trouble connecting to the characters. As in the novel, nothing much happened here. The main character thought some thoughts at home about his dog, and thought some other thoughts at work a GoodReads lists this as coming before book 1 in this new series, but I read it after /The department of sensitive crimes/, which I think would probably be less frustrating for most readers. The characters and general story set-up get more introduction in the novel. Reading this first, the reader might have more trouble connecting to the characters. Ulf is an extremely well-layered character, so much so that I find myself relating to him in such a short period of time. I admire the quickness of his detective mind, his openness about his desires and loneliness. Both mysteries are also equally compelling, which is proof that you don’t need a homicidal angle to write a good mystery. There is such nostalgia to Smith’s work. While reading this book I felt like I was taken back to the good old days of Hercule Poirot and Nancy Drew. Maybe I should Ulf is an extremely well-layered character, so much so that I find myself relating to him in such a short period of time. I admire the quickness of his detective mind, his openness about his desires and loneliness. Both mysteries are also equally compelling, which is proof that you don’t need a homicidal angle to write a good mystery. There is such nostalgia to Smith’s work. While reading this book I felt like I was taken back to the good old days of Hercule Poirot and Nancy Drew. Maybe I should judge a book by its cover more often. Awesome is how I would describe Alexander McCall Smith’s books. He manages to captivate the nature of mankind in all of his books. This same insightfulness is seen in his new series based in Sweden. His ingenuity of combining a story with introspection and laughter is a gift that we can enjoy and allows us to take ourselves from our hectic lives. Can’t wait for the next book so I may enjoy the author’s wit once more. Thanks to Netgalley and Vintage Books for ARC copy of this book to read and revi Awesome is how I would describe Alexander McCall Smith’s books. He manages to captivate the nature of mankind in all of his books. This same insightfulness is seen in his new series based in Sweden. His ingenuity of combining a story with introspection and laughter is a gift that we can enjoy and allows us to take ourselves from our hectic lives. Can’t wait for the next book so I may enjoy the author’s wit once more. Always a pleasure to read anything from this author. This brief introduction to yet another series - McCall Smith is astonishingly prolific - is charming and in his usual quirky gentle style. The main character, Ulf Varg, is a Swedish detective working in the Department of Sensitive Crimes (not sure this is a real thing! ), and is asked to investigate a case in the world of cat breeders. This case, together with a secondary story about his brother who heads the 'Moderate Extremists' party, make u Always a pleasure to read anything from this author. This brief introduction to yet another series - McCall Smith is astonishingly prolific - is charming and in his usual quirky gentle style. The main character, Ulf Varg, is a Swedish detective working in the Department of Sensitive Crimes (not sure this is a real thing! ), and is asked to investigate a case in the world of cat breeders. This case, together with a secondary story about his brother who heads the 'Moderate Extremists' party, make up an engaging read. Yet another series to follow! I was excited to read this new Vintage Short by Alexander McCall Smith. But, ultimately, I was disappointed. Yes, there’s humor in this short story, as there is in all of McCall Smith’s books. However, the plot line didn’t have enough to carry it, and I felt the story was too short to build the characters. I’ll be sticking to his longer, more intricate stories from now on. Told, of course, with wit and compassion. Alexander mccall Smith is my favorite writer. I come away from his literature a better person, always. Fiction/mystery. Introduction to a new series! I did not immediately warm to the new characters like I usually have in previous series, but interested in the setting in Sweden. Eventually drawn in by the author’s writing style and humor. Will give the novel a try. Curious what Ulf will get up to. This short novella is a wonderful introduction to a new series by AMS. The crimes are soft, but for those involved the consequences are real and life altering. And these sensitive crimes need an investigator who is just as sensitive to the stakes at hand. I am looking forward to the series and highly recommend it.